Producer/musician T Bone Burnett has worked his special, low-key brand of studio voodoo with the likes of Counting Crows and the Wallflowers (in addition to wife Sam Phillips, Joe Henry, and a whole gallery of other Should Be Biggers), helping them sell a couple records in the process. 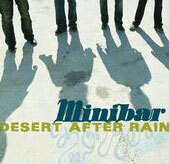 His latest production turn finds him working with a band of expatriate Brits named Minibar. On their fine Road Movies, the four-piece leans slightly more popward than the aforementioned pair, but an appealing rustic quality surfaces frequently -- sometimes courtesy of lead guitarist Tim Walker's turns on pedal steel, banjo and mandolin, but most often in the prematurely weathered vocals of Simon Petty. "Holiday from Myself" can be found waving a huge "Play Me!" banner in radio's direction and then handing it off to the roots-pop twins "Retrospect" and "Visible from Space." My two favorites are "Choked Up," a terrific Ryan Adams' composition that ended up being left off the final version of Whiskeytown's Pneumonia, and the expansive, atmospheric title track. The latter, with verses that lull you into kind of a blissful highway-hypnotic state before leading you into a letter-perfect chorus, is currently making a Song of the Year bid, at least in my house.